Basically, fatigue crack propagation can be divided into three stages: stage I (short cracks), stage II (long cracks) and stage III (final fracture). 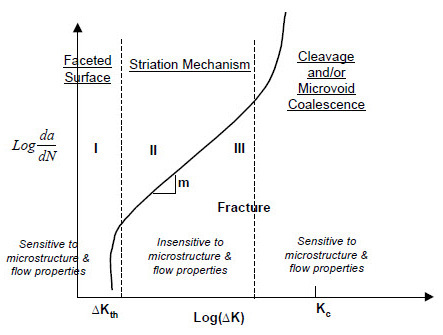 If lower loads are applied, the crack will have to grow for longer before the applied stress intensity factor K, reaches the fracture toughness value of the material, resulting in a smaller area of fast fracture. • Stage I: Once initiated, a fatigue crack propagates along high shear stress planes (45 degrees), as schematically represented in Figure 1. This is known as stage I or the short crack growth propagation stage. The crack propagates until it is caused to decelerate by a microstructural barrier such as a grain boundary, inclusions, or pearlitic zones, which cannot accommodate the initial crack growth direction. Therefore, grain refinement is capable of increasing fatigue strength of the material by the insertion of a large quantity of microstructural barriers, i.e. grain boundaries, which have to be overcome in the stage I of propagation. Surface mechanical treatments such as shot peening and surface rolling, contribute to the increase in the number of microstructural barriers per unit length due to the flattening of the grains. • Stage II: When the stress intensity factor K increases as a consequence of crack growth or higher applied loads, slips start to develop in different planes close to the crack tip, initiating stage II. Whilst stage I is orientated 45 degrees in relation to the applied load, propagation in stage II is perpendicular to the load direction, as depicted in Figure 1. An important characteristic of stage II is the presence of surface ripples known as “striations,” which are visible with the aid of a scanning electron microscope. Not all engineering materials exhibit striations; however, they are clearly seen in pure metals and many ductile alloys such as aluminum. In steels, they are frequently observed in cold-worked alloys. 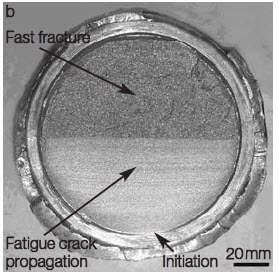 The most commonly accepted mechanism for the formation of “striations” on the fatigue fracture surface of ductile metals, is the successive blunting and re-sharpening of the crack tip, as represented in Figures 2 and 3. • Stage III: Finally, stage III is related to unstable crack growth as Kmax approaches KIC. At this stage, crack growth is controlled by static modes of failure and is very sensitive to the microstructure, load ratio, and stress state (plane stress or plane strain loading). Macroscopically, the fatigue fracture surface can be divided into two distinct regions, as shown by Figure 4. 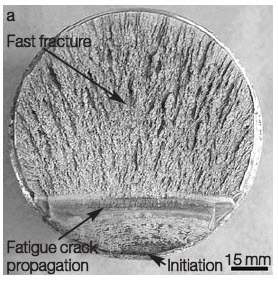 The first region (the lower region depicted in each example in figure 4) corresponds to the stable fatigue crack growth and presents a smooth appearance due to the friction between the crack wake faces. Sometimes, concentric marks known as “beach marks” can be seen on the fatigue fracture surface, as a result of successive arrests or a decrease in the rate of fatigue crack growth due to a temporary load drop, or due to an overload that introduces a compressive residual stress field ahead of the crack tip. Final fracture: The other region (the upper region depicted in each example in figure 4) corresponds to the final fracture and presents a fibrous and irregular appearance. In this region, the fracture can be either brittle or ductile, depending on the mechanical properties of the material, dimensions of the material under stress, and loading conditions. The exact area of fraction of each region depends on the applied load level. 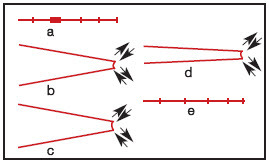 High applied loads result in a small stable crack propagation area, as depicted in Figure 4a. On the other hand, if lower loads are applied, the crack will have to grow for longer before the applied stress intensity factor K, reaches the fracture toughness value of the material, resulting in a smaller area of fast fracture, Figure 4b.